You should be on the list. Thank you. I look forward to your messages. I am excited to share this website with my genealogy class. Thanks! I appreciate those who spread the word about this blog. Family is too big now . I knew Rolfs. its written on the family grave 19th century and Focke Focken Tamen is my grand father and grand grand father . Family from Holtrop / Felde . And I know the family lived in the 17 century in Bueren 20 Kilometres from Felde . I am just now visiting Amarillow Texas .So you related to my Family . It’s not a redundant question at all. Thanks for asking it. I do have a private tree which I generally use for my own personal use–on Ancestry.com just to see what “hints” it finds. I find that blogging about various things I’ve located tends to bring about a fair amount of emails and contact with others and actually parallels the sharing something something specific that you know. Let me think about writing a longer post on this topic. I too wonder about public versus private trees. I will look forward to your post. Thank you for your wonderful “tip of the day” and all your help that you provide. I think you web site is great. I have gotten alot of family info from it. Thanks for this list. I’m inspired! Thank you for posting this. Am I right, then that this numbering system only traces your direct line of ancestors, without mention of aunts, uncles, and cousins? I enjoyed reviewing this. The timeline makes it obvious that my ancestors knew your ancestors. My immigrant HARRISON ancestors are buried in Buckeye Cemetery, Hancock Co. My mother was born in Basco, Hancock Co. in 1908. My dad was born in Golden, Adams Co. in 1903. My parents married across the river in Keokuk IA in 1925. As a child I visited relatives in Warsaw, Carthage and later in Mendon. Thanks for subscribing me. I look forward to new postings. I’m always trying to learn as much as I can about genealogy research techniques. Thank u for this information. Now I know what I need to put down and in what order.I also am making lists of words that I don’t have the meaning 4. I just subscribed to your email list and I’m excited to learn more about digging into my family’s past. I’ve studied my ancestors intermittently for more than thirty years and, like so many others, I love the challenges that this line of inquiry offers. 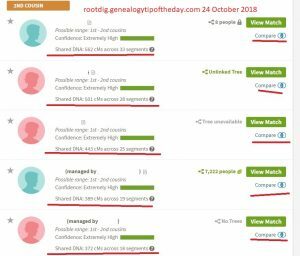 When a “new” bit of information comes to light, it confers a brand of satisfaction that, in my experience, is unique to genealogical research. We may have common ancestors, by the way. One of my great grandmothers is Frisian. This branch settled in Stevenson County, Illinois, and in Turner County, South Dakota. Family surnames include DeVries and Iwwerks, among many others. Many thanks for your time and your generosity. I look forward to your emails. Thanks for your comments and good luck with your research. There was a large settlement of Ostfriesens in Stephenson County. Noted your Tuttle ancestry and wondered if you have any further back? Haven’t looked at my line in awhile, but I go back to Wm. Tuttle and Elizabeth Matthews, if I remember right; and back into England. My line daughtered out quickly, as Sarah Tuttle m. John Humiston in New Haven in 1685. Some of the Tuttles are buried in the Old North Burial Ground in Ipswich, MA. Pretty sure that your John Tuttle is there. If you have a regular email, I can send a pic of his inscription and a link the the site where I read the info. Ward and Waters are also two of my lines, so we are possibly related through several lines. I’m also going to question two cousins who are Sylvesters to see if they might possibly go back to New England. I’ve always wondered about their name. This John (1667-1715, both in Ipswich) was the son of Simon and Sarah (Cogswell) Tuttle. My email’s mjnrootdig@gmail.com. Thanks. 30 years of researching and I’ve never made an Ahnenlist — you’ve inspired me to make one. Thanks! Thank you for the add. I have been researching off and on for about 20 years, but often still feel like a novice. Always eager to learn something new. I’ve enjoyed and gotten significant research tips from your Rootdig posts. Thank you so much. My own research started less than ten years ago and I’m now a little beyond novice (and value accuracy and sources), but still haven’t decided on a satisfying method of ‘summarizing’ and storing each family that I research. I haven’t seen any of your posts address this (but just may have missed them!) Would you consider describing your own methods? Do you have a three ring binder for each family? Or a box (acid-free)? What do you include and in what format? Do you write a narrative or timeline, or just keep copies of all sources? You must have a dedicated room with shelves? Do you just follow direct lines and add their siblings into the same container? Thank you! where can I get blank ahnentafel charts? I spent a lot of time on the computer and only found one place and to get it you had to fill it in first. There are all sorts of blank forms available but not this one. After seeing what you have accomplish, I after 25 years didn’t get beyond the brick wall (l8l8 year) and feel really defeated now. My maternal side is not too hard as the records are good and I knew where all the immigrants were from. My New Englanders are not too bad. I have quite a few holes in my New York, Canada, and Maryland/Virginia lines. I am also an Isaac Allerton descendant, through his daughter Remember, then her daughter Elizabeth Maverick, and her daughter Abigail Skinner. It was fun to see your list of ancestors! Thank you for you filling by color system. I have found it extremely helpful. I have worked on this off and on for forty years. I have information from family, and the internet is very helpful as I don’t travel far. You are welcome, Kathy. Good luck with your research–I’m glad you found it helpful. Habbe Habben from Feld is my Grandfathers brother . His son knows all history I contacting him. He is visiting my mother often . You know more than us . And I am living in Felde ??? I’ve been researching these families for thirty years (grin!). But I’m always looking for new information. My wife is descended from Enoch Tinsley – I have the line back to England prior to the founding of the Jamestown Colony. There are a number of other names of interest in this site but I will have to check my data – I have over 180,000 names in the master file and more in supporting files. Happy to share whatever I have. Thanks for your comment. I’ve got the line back a few more generations. I’m a little more stuck on Nancy Dunaway–wife of Enoch. your John Sargent is my 7th G Grandfather. Thru Gedmatch, I see that we share 12 Cms. I am glad to be involved on this blog site. Great. I’ll have to add that to my list of determined segments. Thanks for letting me know. You have “Rucker”s on your tree!! My husband has Rucker on his tree. They were in Indiana… I’ll have to look at his tree and see if there is a match! Thank you for all you do! Chances are we’re distantly related–especially if his were originally from Virginia. Let me know.